One of trade finance’s latest tech startups, CargoX, is entering the battle to end the heavy reliance on paper in cross-border trade. It is doing so using blockchain technology, thus challenging existing initiatives spearheaded by the likes of IBM, Maersk and Wave. After having raised over US$7mn in eight minutes in an ICO in late January, Slovenia-based CargoX has now released the first version of its new blockchain solution, which in the first instance will digitise the issuance and transfer of bills of lading. It will then turn its attention to the letter of credit. Initially targeting freight forwarders and NVOCCs (non-vessel operating common carriers), the startup is currently in the process of finalising agreements with firms in Europe, China and the US to start piloting the product this month. The aim is to go into production this summer. Speaking to GTR, Stefan Kukman, CargoX’s CEO, says the company started with bills of lading because these documents, which provide proof of cargo ownership, are the “biggest pain points” in the global logistics industry. Today, a conventional paper-based process usually takes five to 10 days to get the document from origin to destination and costs up to US$100. Explaining the inefficiencies of this process, Kukman compares it to that of sending money via online banking. Instead, CargoX’s ‘smart B/L solution’ provides parties in a transaction with a digital proof of ownership on the blockchain – which they can “transfer in just one click”, in Kukman’s words. It enables a smart bill of lading to be created, transferred from the freight forwarder to the exporter, then on to the importer, and finally to the release agent at the port of destination. Lowering the fee of each bill of lading to less than US$10, the tech startup claims it will be able to save companies as much as US$5bn a year on courier costs. In its whitepaper, which outlines the firm’s objectives and timeline, CargoX notes that while “there have been many attempts to introduce an electronic bill of lading”, “none have garnered a wide acceptance in the industry”. It points to the invention of blockchain technology as being the move that has made it “possible for the first time in history to connect all the parties in the logistics industry” in an open, trusted and decentralised ecosystem “with transparently defined rules of operation”. According to Kukman, these features are exactly what make blockchain the perfect tool for the bill of lading. “Working with a document with a value, and with different providers, you need to have something that is communicative between older systems and gets the trust from the market. On blockchain all the parties on the bill of lading can see the transaction and the actual legal owner of the goods inside of the container, and be sure that this is the original,” he says. 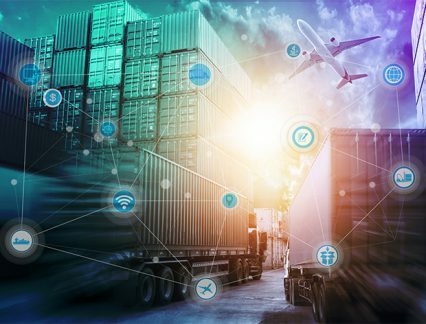 CargoX is not the only firm seeing huge market opportunities in digitising and streamlining documentation for global logistics using blockchain. Israeli company Wave, for one, is building a solution for the digital exchange and management of trade-related documents, including the bill of lading. It completed the world’s first live blockchain trade transaction with Barclays in 2016 and is currently conducting pilots, after having spent the whole of last year further developing its solution. Another big player in this space is Maersk Line, which announced a joint venture with IBM in January. Together the two are working on a blockchain-powered digital platform that gives large networks of disparate trading partners a single shared view of a transaction, including digitising documentation, such as the bill of lading, and automating customs clearance processes. But CargoX is confident that its solution will be able to absorb a significant part of the market, especially given the fact that, unlike the Maersk-IBM project, is not associated with one single carrier. Kukman also emphasises that the company will in due course expand to other services, including the internet of things (IoT) tracking of shipments and solutions for insurance and quality control. It is already working with a local bank to extend the protocol to accommodate the issuance of a smart letter of credit, a feature which will be released next year. The startup is also working on facilitating cryptocurrency payments through its CXO token, which will be used to pay for the services provided.